A completely straight, upright and well tapered trunk with an even distribution of branches is necessary for this style. The first and main branch should be positioned at approximately one third of the trunk's height. 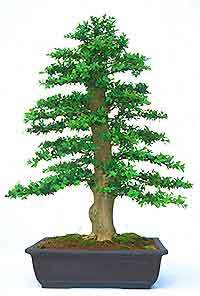 Subsequent branches should form a spiral pattern, becoming shorter and closer together nearer the apex of the tree, thus giving the bonsai a regular outline in the shape of a triangle. Well developed surface roots help give the tree a convincing, stable look and rectangular pots are normally used for this style. This is one of the more difficult styles to create well and often appears somewhat contrived. 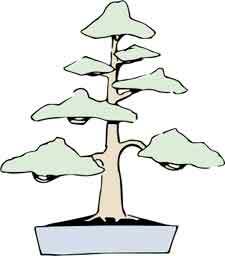 Pines and conifers tend to be the most suitable material, because of their natural tendency to grow in this form. The classic formal upright bonsai style should be reminiscent of a strong specimen tree, where branches have been able to grow naturally with no restriction and perfection of form has been attained.